Hamantaschen cookies are the highlight of Purim. And yet, traditional Purim cookies are not eggless or dairy free, which can be a disappointment for those with allergies. This simple, easy and effortless recipe for dairy free and eggless hamantaschen cookies can be made with any filling. 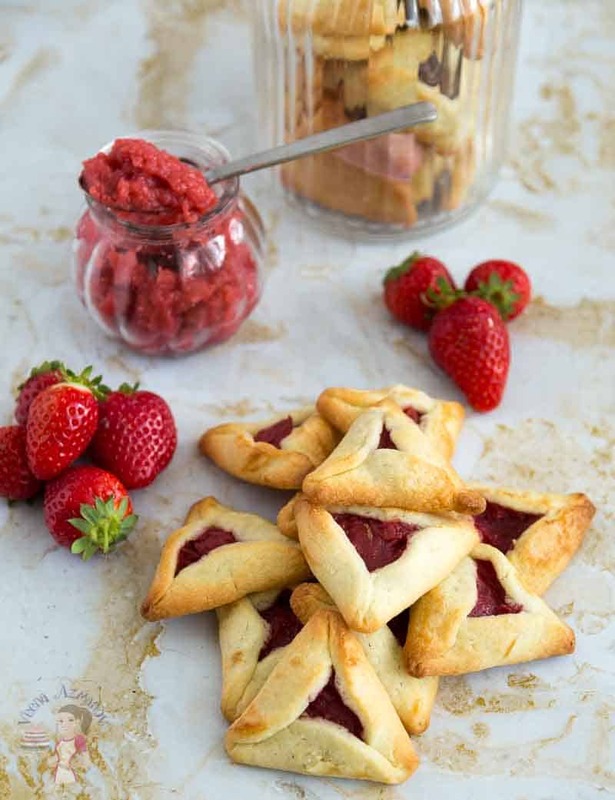 Today we have strawberry filled Purim cookies. Place strawberries and all other filling ingredients in a saucepan. Cook on low heat until the strawberries are soft, all the water filling. Mash the strawberries with a fork or filling in a food processor. Cool completely before filling the hamentaschen. Sift and combine together flour, baking powder, salt. Cream butter, sugar until light and fluffy. Add water - just enough to make a smooth dough. Divide the dough into two. Form each into a flat disc. Place in the fridge for at least 30 minutes or until firm enough to roll. Roll the dough using as little flour as possible. Using a 3 inch round cookie cutter cut as many discs as you can. Place the circles on a baking tray. If the dough has softened place it back in the fridge to chill again. Place a small teaspoon of filling in the center of the disc. Do not add too much filling. The cookie dough is delicious on its own too. Too much filling will cause an overflow and open up. Dampen the disc edges very lightly with water or egg white ( very lightly - just to secure them). Overlap or pinch the three sides of the disc/circle using one of the methods (see video). Preheat the oven at 180 C / 360 F.
Chill the cookies for at least 20 minutes while the oven is preheating. (Chilling helps the cookies hold their shape better). Bake in a preheated oven for about 12 to 14 minutes. Cool on a wire rack completely before you store in a cookie jar. 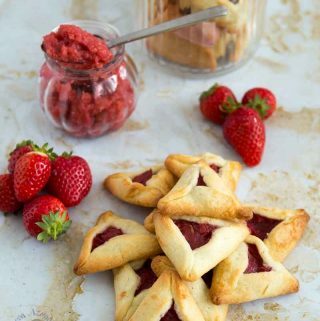 Compared to the other fillings this strawberry filled hamantaschen cookies will stay fresh for up to a week only.